A sequel was definitely in the cards for 2016’s summer sleeper hit “Bad Moms,” a raucously funny comedy that rang true for overworked, underappreciated mothers everywhere amidst the rowdy R-rated material. Released not even a full year and a half later, “A Bad Moms Christmas” is the quickie follow-up, and as with any sequel, it runs the risk of going stale and looking like a money grab. Returning writer-directors Jon Lucas and Scott Moore do have enticing ideas for a continuation, like doubling down on the moms by bringing in three veteran actresses to play the moms’ moms and setting the story around the hectic holidays. However, despite the bright spots of those additions and a few laugh-out-loud moments, this is a less-sharp rehash with snow, holiday wreaths, and a scene-stealing Christine Baranski. For the most part, "A Bad Moms Christmas" has little else to say that the first one didn’t already, and the comedic bits are rarely ever as fresh and outrageous as they were the first time. It used to be the most wonderful time of the year when there wasn't so much pressure placed on mothers to deliver a perfect Christmas for their families. This year, Amy Mitchell (Mila Kunis) just wants a mellow Christmas, as do her kids (Oona Laurence, Emjay Anthony) and boyfriend Jessie (Jay Hernandez). Then, six days before December 25th, overly critical mother Ruth (Christine Baranski), along with dutiful father (Peter Gallagher), arrive to cramp her daughter's style. Always one to put down and one-up her daughter, Ruth already has her own plans to put on a perfect Christmas for her grandchildren, who are spending the holiday for the first time after their parents’ divorce. Harried stay-at-home mom of four Kiki (Kristen Bell) and loosey-goosey Carla (Kathryn Hahn) face similar situations before the birth of Jesus Christ. Kiki’s mother, Sandy (Cheryl Hines), is a clingy type who has no concept of personal space and wears T-shirts and pajamas with her daughter’s face printed on them. And then Carla’s mom, Isis (Susan Sarandon)—yes, like the terrorist organization—is a flaky, gambling-addicted drifter who hasn’t seen her daughter in two years and only shows up in Carla’s life when she needs money. With all three moms stressed out as it is having their lives thrown out of whack from their mothers visiting for the holidays, Amy, Kiki and Carla vow to take Christmas back. 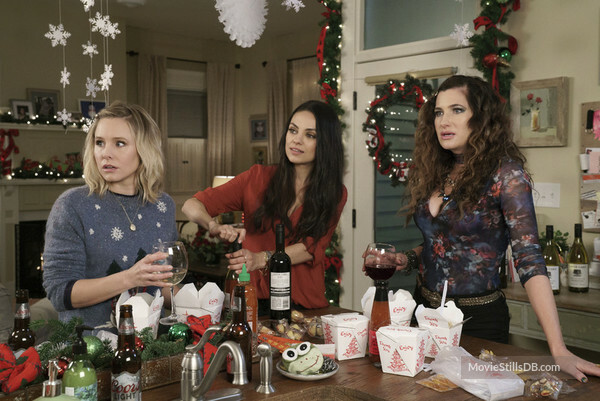 Every once in a while, “A Bad Moms Christmas” finds the laughs and chemistry of the original “Bad Moms” when Amy, Kiki and Carla are together. Regrettably, writer-directors Jon Lucas and Scott Moore separate the original trio of bad moms and have trouble regaining the raunchy-sweet balance of their first film, opting for a pushier approach as if they were trying a bit too hard to strain the inappropriate wackiness. 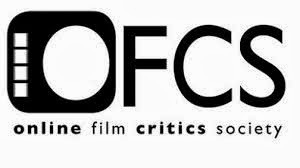 Having one of the kids say the unabbreviated version of "OMFG!" more than three times is one such example. When the film does try to mimic the original’s memorable, hilarious slo-mo montage where the moms went on a drunken bender through the grocery store, each set-piece feels like lazy diminishing returns. It first happens in a shopping mall, where the women grind on Santa and steal a Christmas tree from Lady Foot Locker, and then again in a sequence at a Sky Zone trampoline park that goes on twice as long with a game of dodgeball. The biggest disappointment here is that all three of the moms’ moms are drawn in such broad comedic strokes, until the sudden tonal jump into third-act apologies and would-be redemption arcs where the viewer is now supposed to care about them as real people and find them relatable. Mila Kunis, Kristen Bell and Kathryn Hahn slip back into their roles, and how could they not when so little time has passed? Once again, Hahn is the MVP as the blowsy, uninhibited Carla, and as a delirious comedic force, she scores the biggest guffaws. No fault of the actress, Carla is noticeably even more cartoonish, perhaps psychotic, this time without as much of the endearing decency and heart she revealed before; it’s a surprise that she still holds down her job at a spa or that her one and only son, Jaxon (Cade Cooksey), is still alive. To redeem herself, Hahn does share a sweetly raunchy “meet cute” with a game Justin Hartley (TV’s “This Is Us”), a hunky fireman-turned-Santa-stripper named Ty Swindel with an appendage the size of a “parking cone,” when Carla waxes his undercarriage. This time, the three co-leads must make room for an expanded ensemble. 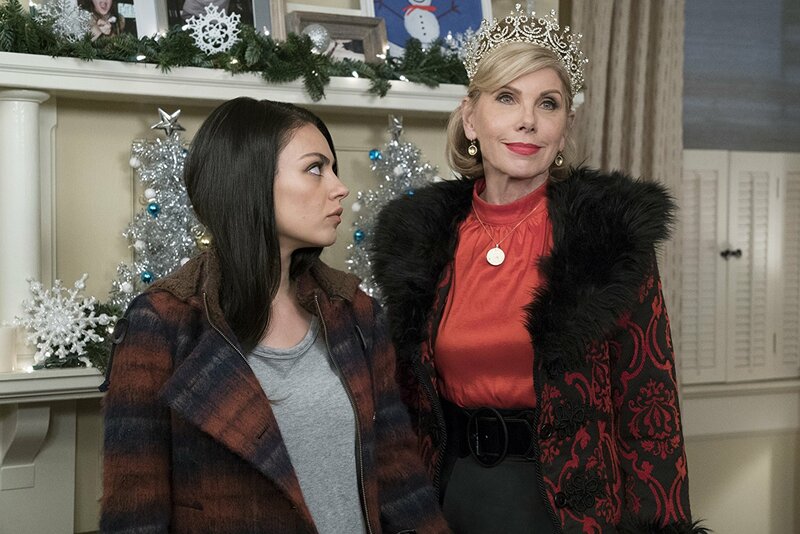 Though she looks nothing like Kunis to play her mother, Christine Baranski is a hoot, rooted in deliciously go-for-the-throat ice queen mode and slaying every cutting criticism aimed at Amy with expert delivery (“I didn’t know Rite-Aid made Christmas decorations!”). The character of Ruth is such an extreme, unsympathetic monster, and yet her Christmas plans are so over-the-top, one can’t help but laugh as she turns Amy’s suburban home into a Radio City Music Hall extravaganza: she hires help to decorate the front yard with a “Twelve Days of Christmas”-themed display that would make Clark Griswold green with envy; she buys tickets for the 5-hour Russian version of “The Nutcracker,” insisting the children will love it; and she has already invited close to 200 guests for a grand Christmas party, complete with special musical guest Kenny G and a sushi bar. Naturally, there is emotional baggage and years of insecurity underneath Ruth's cold exterior. The delightfully bubbly Cheryl Hines was made to play Kristen Bell’s mother, but her character Sandy is stuck as a one-note caricature, the kind of mother who creepily sits in the bedroom as Kiki and her husband get it on and then later buys the house next door. Susan Sarandon is better, knocking Carla for caring about her son as if it's a new “parenting trend” and at least making it clear from whose uterus conceived Carla. Unfortunately, Christina Applegate, as the PTA baddie from the original, only stops by for a cameo but makes her very brief screen time count. A sillier, more slapdash, altogether lesser “Bad Moms” is still eager to please, but there wasn’t enough time in between the moms’ last rebellious boycott and their latest to make “A Bad Moms Christmas” a worthy successor or make audiences crave another. Whether or not it was the result of STX Entertainment knowing they had a hit on their hands and had to rush out a sequel as soon as they could without any rewrite, one can only forgive so much when the once-deft blend of raunchiness and pathos feels more labored. The film has just enough laughs to not be a complete bust, but be that this is a Christmas movie, too, there has to be an obligatory, sentimental resolution that is only earned for the commitment and emotional range of Mila Kunis, who delivers a teary-eyed heart-to-heart to Ruth in a pew during Christmas Eve mass, rather than in the ways the characters have been written. Whereas "Bad Moms" was sneakily perceptive and true in its foundation, "A Bad Moms Christmas" is more threadbare and dramatically unconvincing. Twelve months will tell if we’re going to get “Bad Grandmoms” — for better or for worse.